Hey everyone…it’s time for another festival! We meet on May 11 at ClearView Church in Oakville, 10am to 2:00pm. Send Marlene an email at marlene.nirula@gmail.com and tell her you’re coming. LOTS OF MUSIC… LOTS OF FUN! Our recent festival was a special time for everyone! Our two special musical guests for the day were Jacob Moon and Brian Beaver, known as DJ Shadow. Jacob gave a concert in the morning and Brian played music for our dance in the afternoon. Jacob is a full-time musician from Hamilton. He’s a talented singer/songwriter who plays a busy schedule of concerts throughout Ontario. 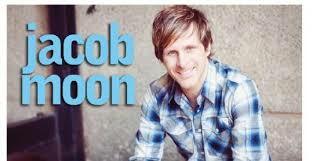 Learn more about Jacob on his website at www.jacobmoon.com. Brian lives in Acton and he has been spinning dance tunes for several years now. You can contact him at 519-853-2347. The theme for the day was “Shelter Me!”, the title of one of Jacob’s songs. The song tells us that whatever happens in our lives, we can always find love and shelter “underneath God’s wings”. God will protect and see us through any difficulties we face. One very meaningful song that Jacob sang was called “On My Knees”. The song is a tribute to his dad, who has persevered and trusted God while dealing with a physical disability. It was great to have students from King’s Christian Collegiate in Oakville join us for the day. They helped with registration and serving lunch, as well as performing a skit about the importance of helping others. Lunch was catered by Troy’s Diner of Milton. Everyone enjoyed their french fries and hamburgers. Our friends and guests enjoyed the “photo booth” pictures taken by our photographer Geoff. They also enjoyed meeting the four therapy dogs brought by their owners. These beautiful dogs are sponsored by St. John Ambulance and attend various events in the community. Many thanks to everyone who helped make a successful festival. We are pleased to hold the festival at ClearView Church. It’s an excellent facility and the church staff are very welcoming. Best wishes to everyone who attended the festival. We ask God to bless and keep our friends, their parents, mentors, Friendship club leaders, group home staff and festival volunteers. All the best to the various Friendship clubs who attend the festival. Have a good year learning about God’s love and sharing good fellowship with each other. So… when is our next festival? Our next festival will be held on Saturday, May 11, 2019. Mark the date on your calendar. See you there! Check out Jacob Moon at www.jacobmoon.com. Keep in touch with us on facebook at Friendship Festival Ontario. We had a great time on May 12, 2018! Read more about Tim and his Compassion books at compassionseries.com/about/tim-huff. We sang and laughed and met new and old friends. Everyone enjoyed lunch and an ice cream cone from Ike, the ice cream truck guy. The therapy dogs from St.John’s Ambulance were fun to have with us. Dave Petkau took pictures at the festival and put together a video. Here it is. There was lots of excitement and plenty of smiles to go around as people started arriving for our twelfth Friendship Festival. On October 28, about 250 people met at Clearview Church in Oakville. About 130 friends were joined by more than a hundred Friendship Club volunteers and mentors, parents, group home staff and festival volunteers for another day of festival fun and friendship. The day began as we watched an energetic video of this song, sung by Hezekiah Walker, and accompanied by more than a hundred people dancing along with the song. Kevin Loten, pastor of Chartwell Baptist Church in Oakville, spoke about the praise we give to our favourite athletes, and about the movies and music and food we enjoy. He reminded us to praise God for everything in we receive and enjoy, for our land and for our country itself. In the Psalms we read that “every praise is to our God”. Kevin then lead us in singing and we enjoyed songs written and sung by Joel Angelis and Karina Scali. The Masters family from Woodstock sang a song about the cross of Christ, and their daughter Jericka-Lyn followed this with an interpretive dance of the song El Shaddai. Throughout the day, Elise Goodhoofd of Toronto worked on depicting our theme on canvas. She produced a beautiful piece of artwork, highlighting EVERY PRAISE by depicting words she heard throughout the day on her canvas, as well including the names of some of our friends. Please check our photos for this amazing artwork. Her artwork will hang at Clearview Church. The morning’s program was followed by a tasty lunch, prepared by a group of enthusiastic volunteers. After lunch, everyone had a choice of six different activities, including games, a craft, listening to stories and learning about Canada’s 150th birthday celebration. draw prize or a potted flower. Taking home a flower at the end of the day has become one of the small “traditions” of the festival. Two guests at the festival were Heather DeBoer, the Canadian representative for Friendship Ministries and the organization’s executive director, Tom VanWingerden, who drove from Grand Rapids, Michigan to be with us. They had an opportunity to speak with Friendship Club leaders about their new curriculum called “Together”. 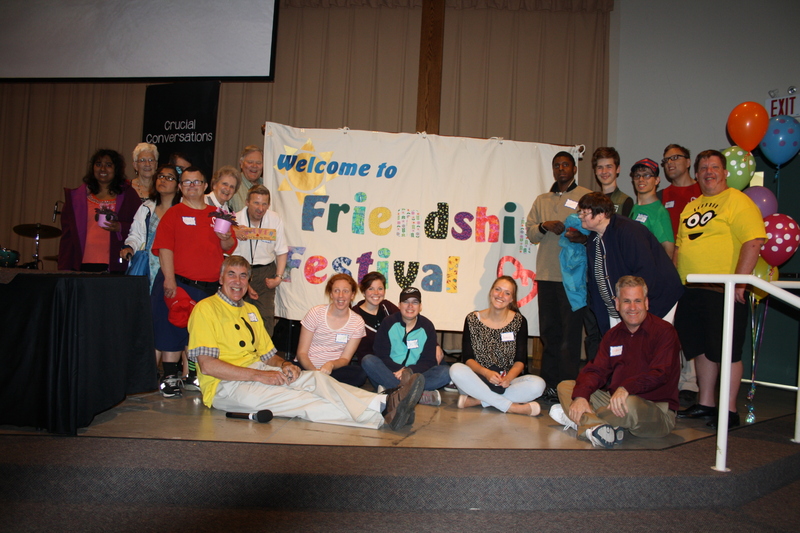 For more information about Friendship, visit their website at www.friendship.org. Many thanks to the dedicated volunteers who helped make this festival a success. We also thank local businesses and individuals for their generous donations of food, flowers and financial donations. Our next festival will be held at Clearview Church on May 12, 2018. Here’s an article about the festival, published in the Banner magazine. Over two hundred people attended our most recent festival on June 6. Everyone enjoyed a day of good fun, food and friendly fellowship. The theme for the day was “God Knows My Name”! Hugh Cook began the day by reading from his novel Heron River. In the story, Woody takes four young men living in a group home out into the backyard at night. As they gaze into the starry night, Woody says, “God made every one of those stars. And he knows each one by name.” And just as God knows the each star by name, Hugh continued, he also knows each one of us by name. Jim Reese continued this theme and spoke to us about God’s care for each one of us. By way of storytelling and music, Jim showed us that Jesus is the Good Shepherd and that he looks after us and keeps us safe. We were pleased to have Rev. Reese, his wife Adrienne and their son Steven at the festival. The Reese family began Christian Horizons fifty years ago and we are thankful for the love and support this organization provides for the many individuals in their care, both in Canada and abroad. After the day’s introduction, everyone was divided into two groups. One group enjoyed a presentation by Creature Quest, who introduced us to a variety of birds, small animals and reptiles. Everyone was fascinated to learn more about these beautiful creatures and view them up close. The second group chose from various activities such as the “famous” Fun Tunnel, balloons and foamies, tower time and the water drop. Everyone was invited to decorate a wooden plaque with their name, reminding them of the day’s theme. After a delicious lunch of hamburgers and all the trimmings, the two groups switched activities. During lunch, we played two games and watched an amazing presentation by five young people. It’s hard to describe what they did… sorry, you had to be there to see it! At the end of the day, everyone met together to sing and say goodbye. Our next festival to be held on Saturday, October 24. We’ll meet at Clearview Church in Oakville, at our usual time, 10:00am to 2:00pm. Our featured musician will be Peter Slofstra, who lives in Courtice, just east of Oshawa. Peter has been writing and singing songs for many years. You’ll enjoying listening to his songs, as well as singing along. We’ll have other musical guests as well, so you’ll want to attend! Registration will begin in early September. Please send an email to Herb Goodhoofd at herbgood@gmail.com if you wish to be on our mailing list, or check this website in September for registration information. See you in Oakville on October 24! One of our friends shared his thoughts about the music he enjoyed at our recent festival on November 1. With everyone singing and laughing and enjoying the music, the place was rocking! About two hundred people came together at ClearView Church in Oakville on Saturday, November 1 for our eighth Friendship Festival. We enjoyed a time of singing and listening to good music, sharing a delicious lunch and playing games together. Our theme for the day was “God’s love helps us to… Stand Strong!” We laughed when a group of young people portrayed this theme in the ‘Great Canadian Jenga Challenge”. We listened carefully as Adriaan Steenkamp reminded us of Biblical characters who were able to stand strong when they met difficulties in their lives. We were reminded that all of us need encouragement to “Stand Strong” every day of our lives. The key to “Standing Strong” is to be thankful, trust God and rely on his love, grace and mercy. Our festival’s featured musician this year was Jordan Raycroft. We enjoyed his strong melodies and tapped and clapped to the pleasing rhythms of his songs. You can discover more about Jordan and listen to his music at www.jordanraycroft.com. We also welcomed Jericka-Lyn Masters, Robin Holmes and Joel Dickinson as they shared their musical talents with us. Jericka-Lyn danced wonderfully to the beautiful song “In Christ Alone”. Robin had us clapping and cheering as he played the piano and sang two dynamic songs, including his own song “I’ll Always Have My Friends”. Joel played his electric guitar and accompanied our singing at the beginning and end of the festival. Thanks go to everyone who helped out at the festival. We thank Ellie, Marlene and Michelle on the planning committee, our amazing musicians, our enthusiastic young people and the friendly volunteers who ran the games. Let’s not forget the friends who worked in the kitchen to prepare a tasty lunch. As always, we thank the local businesses and individuals who donated food and money to make the festival a special day. Check out the photos of the day’s activities on the right side of this page in Past Events. Everyone is invited to attend our next festival, to be held at ClearView Church in Oakville on Saturday, June 6, 2015, from 10:00am to 2:00pm. The festival will feature games, good food and good fun. Registration begins in early April. See you at our next festival! LOTS OF FRIENDS…LOTS OF FUN!!! This year’s festival at E.C. Drury High School in Milton on May 25 brought together 180 friends, as well as another 60 parents, mentors and volunteers. The spirited singing at the start of the day, the sharing and laughter during the day and the enthusiasm seen at the various activities seemed to indicate that everyone had an enjoyable time. Approximately twelve Friendship clubs throughout southern Ontario were represented, as a number of friends who live in group homes in Milton and surrounding communities. A bit of a theme for the day was “butterflies”. Butterflies not only remind us of God’s creation and care for all his creatures, but they also show us that all of us go through various stages and changes in our lives. And while butterflies are beautiful and colorful, they are also very fragile. Life seen from this perspective means we need to take good care of each other. As always, many thanks to everyone who made this a special day. – volunteers who ran the activities, including the Chartwell Church youth group – special thanks to the brave volunteers who sat under the water balloon drop! Take a peek at the festival pictures on the right side of this page, and stay tuned for our next festival. For information about the festival, please contact Herb Goodhoofd at 905-469-9295. EVER HEARD OF A DIGERIDOO? The digeridoo is a unique Australian instrument, one of the musical treats enjoyed by everyone at our recent Fall Friendship Festival, held in Oakville on Saturday, November 10, 2012. Friends, mentors and volunteers enjoyed music, singing, a magic show, a tasty lunch and lots of Timbits! Our special guests for the day included Tim Miller, Don Robertson and the Spirit Movers from the l’Arche Daybreak community in Richmond Hill. Our theme for the day was “Seasons change, but God never changes!” We laughed when a group of young people “acted out” the four seasons. We reminded each other that while the seasons change, God’s love and faithfulness never changes. God loves us every day of the year! In the morning, Tim Miller sang and led us in singing. Everyone enjoyed it when he played his guitar, the digeridoo, an African drum and the bagpipes. Then the Spirit Movers shared God’s love with us as they sang and danced to a couple of beautiful songs. After lunch, Don Robertson kept us guessing with his magical tricks. We finished the day as Don led us in a couple of closing songs. Many thanks to everyone who contributed to another enjoyable festival, including Tim and Don and the Spirit Movers, the friendly and energetic young people from Chartwell Baptist Church, the folks who worked in the kitchen to prepare lunch and the local businesses which gave donations. Many thanks to each one of you! Go to PAST EVENTS on the right side of this page and click on the PHOTOS for November 10, 2012 to check out the fun. “WE LOVE OUR FRIENDS” provides opportunities for fun and fellowship for our friends with developmental disabilities. <ahref=”http://www.weloveourfriends.com”>”We Love Our Friends” organizes festivals and concerts throughout the year. These events include games, music, food and time to socialize and meet new friends. Our festivals have two primary goals. It’s an opportunity to tell our friends that they are loved by God – and by us – and we want to provide a day of fun and fellowship at minimal cost. We support the friends and mentors/volunteers of Friendship Clubs in various churches around southern Ontario, as well as group home residents and staff members, whether or not they are members of a Friendship Club. Everyone is invited to attend! Find out more about Friendship Clubs by visiting their website at www.friendship.org. Designed by Alan Good Designs.